Javier S. Medina is a craftsman and restorer specialized in the making of mirrors and animal heads which he calls ‘ecological trophies’. 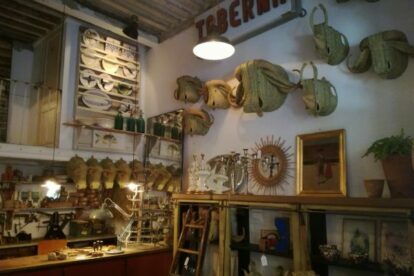 His work is purely self-taught and handmade, and he always uses natural materials like bamboo, wicker, rattan or fibre. Even his leather aprons are made by him, taught by his shoemaker father. Everything you see outside and inside the shop is artisanal – including the atelier itself, an old garage that was totally renewed by him (ask him about it and he’ll give you all the amazing details!). Last time I visited his workshop, he was making some huge bull heads for a restaurant in NYC. But that’s not a surprise, as he became a bit more popular in the interior design business ever since Sarah Jessica Parker entered his shop by surprise. Even if you aren’t planning to buy anything, just cross the doors and travel to the past. The smell of the wicker, the tools… Besides, he’s really friendly so just ask him anything and he will tell you some of his great anecdotes from being a handicraftsman in the city.